Whether we’re failing to stick to a diet, breaking the speed limit or not adopting new behaviours at work, we are great at rationalising our resistance to change. When we find ourselves eating chocolate biscuits or cream-cakes we tell ourselves things like, “Just this once” or “I need a bit of energy” or “The diet begins tomorrow!”. Equally, we tell ourselves, “I’m a good driver” or “The road’s clear” to justify breaking the speed limits, though we know hundreds of drivers, passengers and pedestrians are killed in car accidents every year. This behaviour is called Cognitive Dissonance Reduction. We feel conflicted when our actions go against our better judgement. 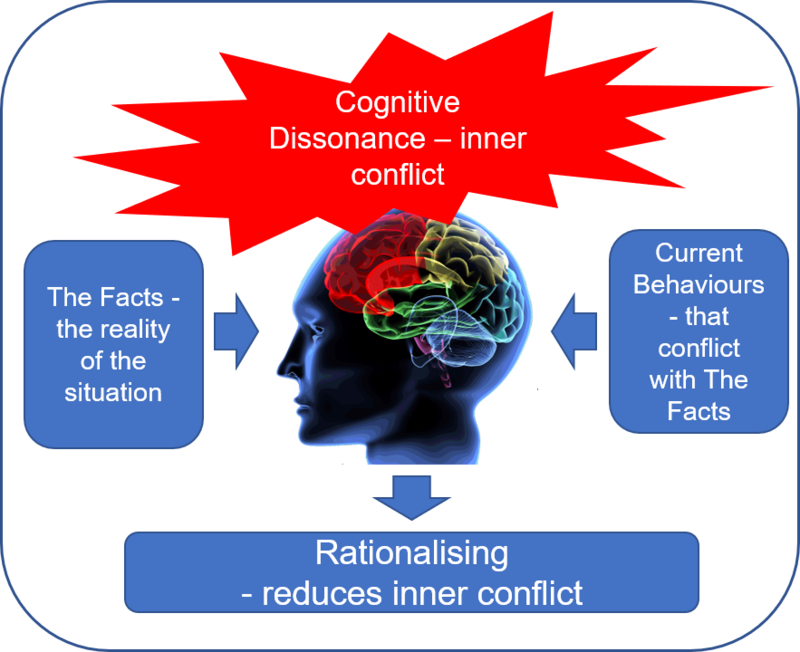 To relieve our inner turmoil, we rationalise our behaviour. At work, we fail to adopt new behaviours, even when we know they will benefit us, our colleagues or our customers. Typically, people rationalize their actions by saying things like, “Other people aren’t doing it, so why should I?” or “I never had problems doing it the old way” or “The last change failed”. These excuses help dispel the inner conflict we feel as we ignore the evidence and carry on as before. So, what is the cure for rationalisation? In addition, we can raise people’s awareness of how rationalising can undermine change and make it ok to challenge each other when spot each other rationalising.